Introduction: Mary Harrell-Sesniak is a genealogist, author and editor with a strong technology background. In this guest blog post, Mary shows how to spot spoonerisms (the accidental switching of sounds or letters in two words, often to humorous effect) and other name mistakes when searching for your ancestors in old newspapers. 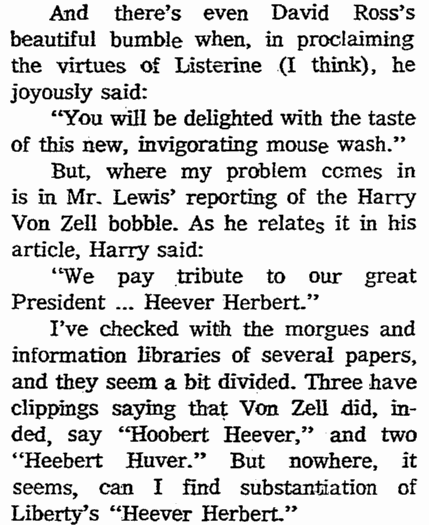 Creativity is essential when searching for forebears in old newspapers—especially when misspellings come into play. Names can be abbreviated, truncated and spelled in a variety of fantastical ways—including one aberration you may not have considered: a spoonerism. Their brain meant to say, “Is it customary to kiss the bride?” and “Let me show you to your seat,” but a disconnect or “fain brart” got in the way. You could chalk the unique phraseology up to imbibing, but more likely the speakers were sober and unintentionally mimicking Rev. William Archibald “W. A.” Spooner (1844-1930). Known for his linguistic acrobatics, Spooner frequently misspoke—as when he gave a toast at Queen Victoria’s Jubilee Celebration. 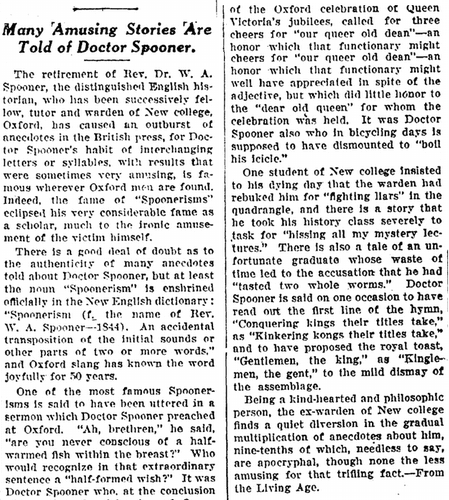 “Three cheers for our queer old dean,” he said. That might have been the end of his days as toastmaster except the hilarity of the moment kept Dr. Spooner in high demand. His name is now used to describe the humorous speech mistakes for which he was famous, in which sounds or letters are transposed. More of Spooner’s spoonerisms can be found in this 1924 newspaper article. The phenomenon of linguistic tongue twisting may be done on “porpoise,” but more likely it is done by accident. No matter the intent, spoonerisms occasionally appear in newspaper reporting—and the tangled results may limit your search results. If your initial results are few, try searching on a clever spoonerism of your ancestor’s name by employing wildcard characters (such as ? or *) to substitute for letters that may be accidentally transposed. Another type of genealogical search challenge occurs when a name is simply misreported or misspelled in the newspapers. When in doubt, search a week or so after an event to see if there has been a correction made to your ancestor’s name—and if you find one, be sure to keep a record of both versions of the name for future searches. In the following example, the name mistake is somewhat of a spoonerism (Bovee was used for Obee), and reminds us that once you spot a misspelling, keep it on your short list for further search possibilities. In this example from a 1921 newspaper, the writer got the name completely wrong. O. 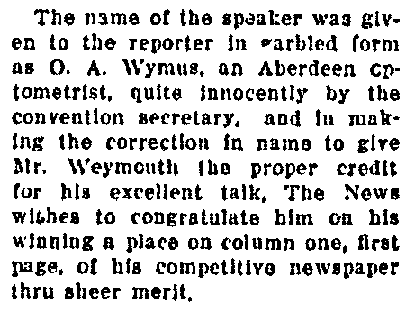 A. Wymus, an Aberdeen optometrist, was reported as the speaker of an event, when a Mr. Weymouth should have been credited. Too bad the given names of the incorrect person were abbreviated as mere initials, and totally eliminated for the correct speaker—otherwise, we would have been able to see the full extent of this mistake and perhaps discover a spoonerism at work! Another common name error found in newspapers derives from ancestor and spouse swapping. No, this isn’t a form of genealogical adultery, but instead a mistake that occurs when a family member’s memory is foggy, or when one person is more prominent than another, resulting in an incorrect name being given to the newspaper reporter. I recently found an example of this kind of marital mistake while doing my own family history research. My great aunt’s obituary reported that she was married to my great grandfather instead of my great uncle. My great grandfather was perhaps the better known of the two brothers in their hometown and his name would therefore come more readily to people’s minds. Now, there are legitimate instances in which a widow or widower marries one’s brother or sister-in-law, but in my family, it taint rue. For those of you who are wondering why I haven’t shown this incorrect obituary, I elected not to because—as any geasoned senealogist knows—once a mistake is recorded, certain enthusiasts repeat the error over and over and over again, forever rouding the clesearch! Here is your latest genealogy challenge, readers. Post your best example of a genealogical spoonerism in the comments section of this blog. I can’t wait to read them—I always love a good laugh! wife’s maiden name listed on one census as family name (with her appearing first and husband away) but on census before and after husband’s name is listed for entire family. Angela, Thanks for sharing those examples. Love the one about the mother’s name being Mama. Sounds like one of the children provided the information. W. A. Spooner might not have married were it not for his slight of tongue. Tradition tells us that whilst visiting a maiden to whom he was attracted, he wanted her to serve tea. But in his haste he said, “Take me.” She did.